We went to Lowe’s today and I bought some storage things that I am so excited about. They are towers with canvas drawers in them. They have the days of the week printed on the canvas, but I figure I can turn the drawers around so that doesn’t show. The towers are on wheels,too, which I think will be really helpful. They will be used for dyed, picked wool, ready to be carded. Right now I have about 25 colors of wool from my dyeing frenzy this past week. As I run it through the picker, I have been tossing it in cardboard until I can get it to the carder. 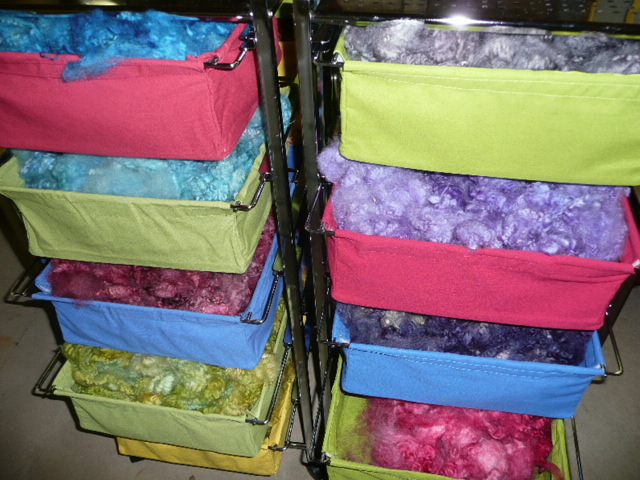 Now I can put the colors I am going to blend into one tower, and just roll the tower over to the carder. It should simplify my carding procedure. This weekend there are several gatherings I have to miss just because there is so much to do yet. One group was driving up to Muskegon to spin at Jenna’s house, the other is the group that spins at my friend, Steve’s. Bummer. My neighbor called and told us to walk over for dinner tonight, which we did and we had a wonderful time. Jim even played Pictionary, if you can believe it. He was good at it, too. We met the folks who own The Spruce Cutter’s Cottage, a B &B down 126th from us, and another couple from Chicago. It was just a fun evening. I needed it! Today, I finally cut into some of the fabric I have been weaving for the past year. A long length of wool cashmere blend made two kimono- like garments, one a short vest and the other a longer tunic. I am crocheting edgings around them. I need to get to bed, but am enjoying the buzz I have. We took Samuel Adams Cherry Wheat to my neighbor’s dinner, made with Michigan cherries, I might add. Jim drank a bottle of that and gave me a sip. Delish! But I brought Lakeshore Demi Sec from Fenn Valley and finished off that bottle. So not like me. But I could get real used to that, fast. Wow. However, in this state, not much can get done. No sewing, no dyeing or carding, that is for sure….too dangerous! But I can blog, and whatever seems too creepy tomorrow I can delete. Good night, readers. I love you!